Some people believe in coincidences, and so do I, in some instances. Nevertheless, for the most part, I think that the world in which we live has always been shaped by men and women who posses a practical understanding of metaphysical principles. For some of these individuals, this understanding is the product of inspiration, while for others it is comes from perspiration. Whether it is through persistent study, or natural insight, an individual who can consistently apply their understanding of metaphysics to achieve a tangible goal in the temporal world is nothing less than an artist. 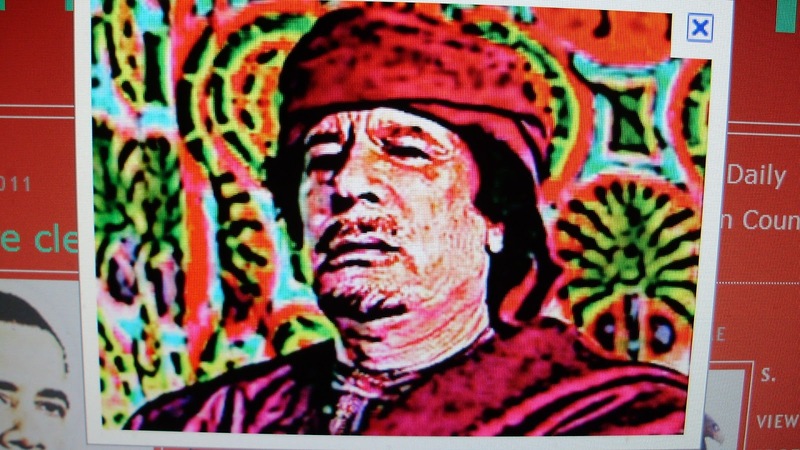 In this blog I wanted to take the time to briefly examine how the application of metaphysical knowledge was intentionally used to aid in the demise of Libyan leader, Muammar Gaddafi. Today the LibYAn leader was ritualistically murdered in the zodiac sign of LibRA. In Hebrew, the word YARA may have different meanings depending on the context in which it is used. It is sometimes used as a reference to the etheric energy that emanates from individuals who have been forced to submit to a perceivably stronger power than they. With Gaddafi’s murder, the U.S. is definitely sending a clear message to African leaders and their people who do not cable toe the line of Western hegemony in Africa. At the end of the day, their efforts are futile. For the U.S. it’s all about the induction of fear, but you cannot deny the divinity of a people who originally exposed the world to all that is divine. In attempting to do so, you eventually force them to reawaken that divinity which proves to be your undoing. However, when we take a close look at the Gaddafi ritual, we find some interesting facts that call out to us for observation. For instance, Libra is the 7th house of the zodiac, and if you add up the numbers in today’s date (10/20/2011) you get number 7. Gaddafi’s murder came 7 months after the Libyan uprisings fomented by U.S. intelligence. So, what we have here are three sevens (777). The number, “777” has a very significant meaning when placed in the context of Judeo-Christian mythology. When the angel Lucifer fell from heaven to earth, his descent was followed by three lighting bolts that resembled the number “777.” Lucifer is usually associated with the planet Venus, which is known as “The Morning Star.” The color sacred to the goddess Venus is green. It is also said that during the war in heaven the Archangel Michael cut a green jewel (Lapis Exillis) from Lucifer’s crown which ultimately sealed his fate. 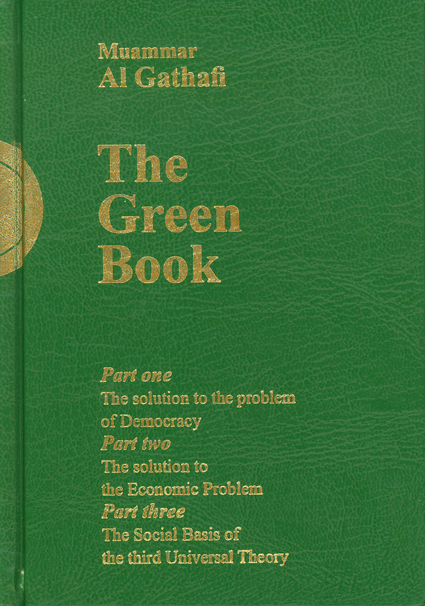 Gaddafi’s initial claim to fame was his famous Green Book, which outlines his political philosophy. Gaddafi was also famous for his personal female bodyguards who wore high heels while brandishing machine guns. The Arabian deity Al Uzza was a goddess of beauty and war. I talk about her in more detail in my blog The Secret Herstory of Islam. Like Venus, Al Uzza’s sacred color is green. Venus is also the goddess of material wealth and prosperity. Gaddafi was the financial benefactor to several Sub-Saharan nations in Africa. He also gave Nation of Islam leader Min. Louis Farrakhan millions of dollars back in the 1990s. 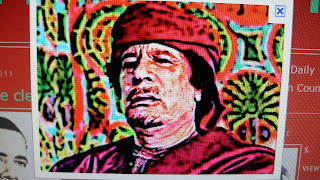 Interestingly, Gaddafi was murdered on the birthday of Calvin Broadus, who is more internationally known as Snoop Dogg. Snoop Dogg is the embodiment of the Anpu/Anubis archetype. He even looks like a Doberman. On his album Paid the Cost to be the Boss he has a song entitled “Da Bo$$ Would Like to See You.” The boss that Snoop is referring to is Ausar. Near the beginning of the song he even says that he’s “Hieroglyphically speaking” (0:23 seconds in). And this is not to say that Snoop even knows who Ausar is, and then again maybe he does. It really doesn’t matter, because you are who you are, whether you’re conscious of it or not. Snoop Dogg was the rap star who initially introduced millions of hip hop fans to Death Row Records. Anpu introduces disincarnated souls to the realm of the dead, which is exactly where Gaddafi went today. As I’ve stated in the Lucifer Experiment series, the Lucifer myth is really about the Black man and woman’s vibratory descent into the flesh, and Gaddafi’s murder was a ritualistic reenactment of The Fall because he was an African head of state and Africa is where Lucifer landed when he fell from the ethers. Libya’s flag is even red, black and green, which are the very same colors in the Black Nationalist flag. 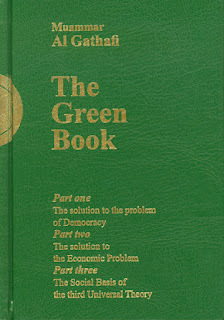 By no means am I championing Gaddafi as some kind of martyr for the cause of Black self-determination. However, I do think that his murder carries a strong symbolic significance in terms of the time that it was carried out. While people debate about the distraction known as Occupy Wall Street, the United States and China are in a race against time to Occupy Africa.